New Delhi is holding out for favorable pricing and guarantees that Dassault will invest in the country. 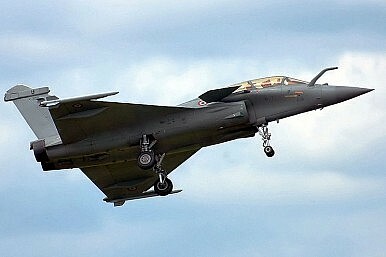 According to Reuters, which cites Indian defense officials with knowledge of the matter, the Indian government and Dassault are negotiating the unit price of the fighters. Reportedly, the sale has become complicated by an Indian request that Dassault Aviation invest “a big percentage” of the revenue it’d receive from this sale in India. The Indian demand appears to be an attempt to have this sale benefit India’s indigenous defense industry, which would have received a boon had the original MMRCA RFP with Dassault gone through. Of the 126 aircraft that were originally planned, New Delhi wanted state firm Hindustan Aeronautics Limited (HAL) to build 112 units in India. Concerns over liability and quality assurance kept Dassault from accepting those terms, delaying the MMRCA’s timeline over several years until its official implosion last month. The new delays highlight hesitation on the Indian side regarding the government’s decision to go with a purchase of 36 units in “fly-away” condition. One of the Indian officials who spoke to Reuters notes that, “Since there is no technology transfer, the price that was on the table during the commercial talks ($200 million per unit) cannot stand.” With the original MMRCA, New Delhi expected technology transfer and manufacturing responsibilities. Still, as earlier reports have noted, the asking price is what Dassault offers the French air force. The IAF’s purchase of Dassault Mirage 2000s in the 1980s took place under similar pricing terms. It seems that from New Delhi’s perspective, 2015’s deal with Dassault should look better than the Mirage purchase. As I noted recently, now that the MMRCA tender for Dassault is no more, New Delhi is expected to announce that the remaining 90 units MMRCA units needed by the IAF (in addition to the 36 Rafales) will be built within India. In the meantime, it’s unclear just how far Indian negotiators will hold out with Dassault to conclude the 36-jet deal on terms favorable to India. The Indian government is going the domestic route to fulfill its MMRCA requirement. Will this work? India Seeks 57 New Naval Fighter Jets for CarriersIt's Official: India and France Sign $8.7 Billion Deal for 36 Rafale FightersIndian and French Defense Ministers to Meet in Singapore to Discuss Rafale Deal India to Pay $9 Billion for 36 French Fighter JetsWill India and the United States Coproduce Fighter Aircraft?